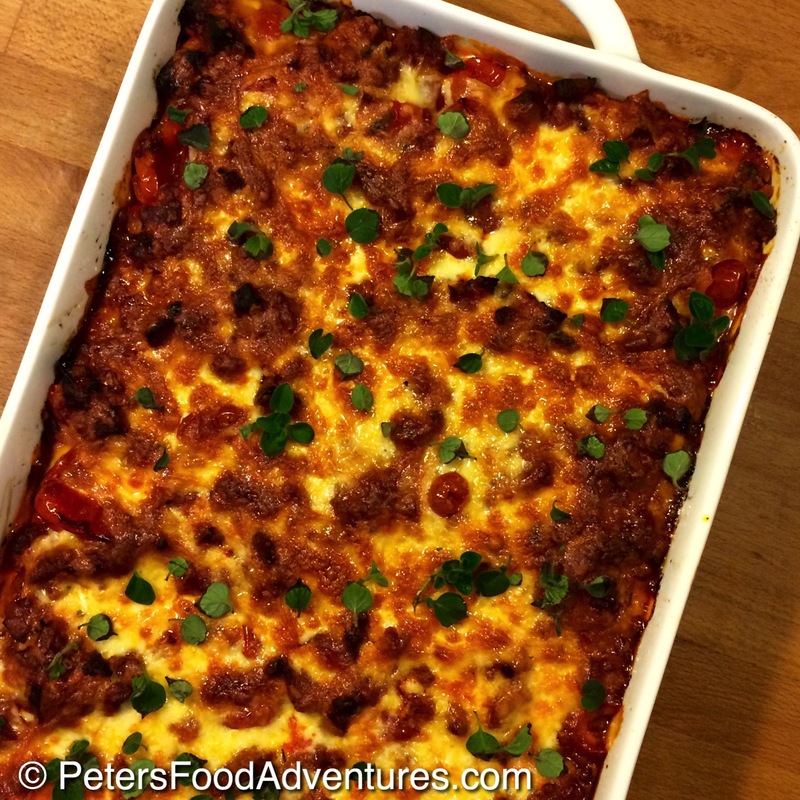 I love this Italian Meat Lasagna recipe, made tastier with spicy Chorizo and Ricotta cheese. This is my favorite lasagna recipe. The chorizo adds a smokey flavor with a hint of spiciness. Chorizo is a sausage that has roots in Spain and Portugal, and is popular around the world. When I first tried lasagna, I thought it was the best thing ever invented. My childhood favorite was my mum’s Lasagna with Cottage Cheese. Moving to Australia, which has more European influences due to immigration, I got to try many different types of Lasagna. 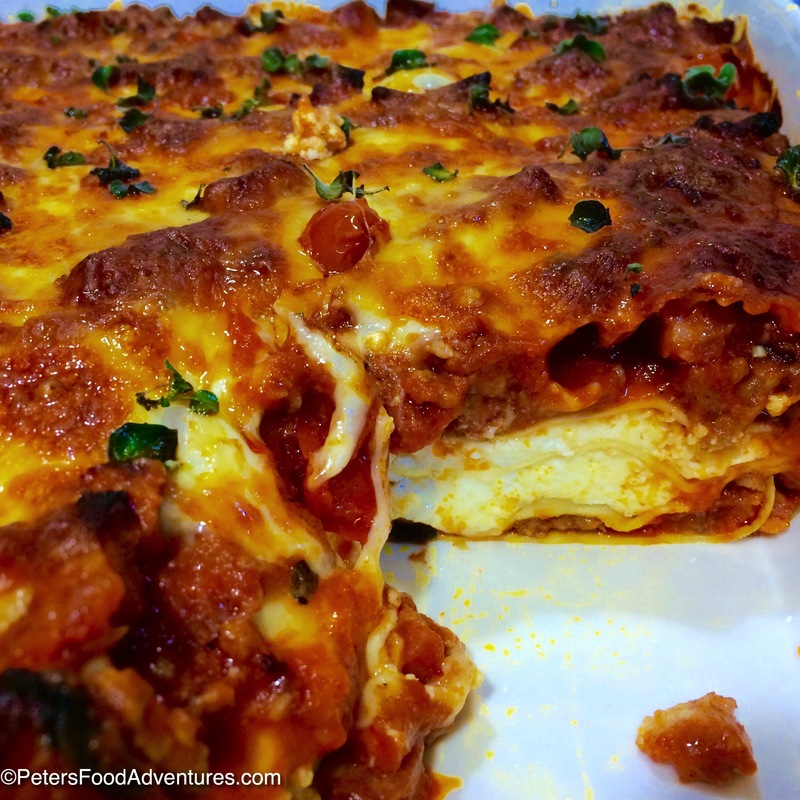 Most Lasagna recipes in Australia are made with Bechamel sauce called Lasagna al Forno. Across Italy, there any many different ways to make Lasagna depending on the region you are from. This Meat Lasagna recipe with Chorizo has a rustic feel, and is jam packed with flavor. This Lasagne recipe can be expensive due to the ingredients. Here are some money saving tips. I bought my Chorizo at Aldi, and it was delicious. If you can’t find Chorizo, then any smoked spicy sausage will work. Instead of using Ricotta, use Cottage Cheese. Instead of Fresh Lasagna sheets, use oven ready boxed Lasagna Sheets. If you can’t find canned Cherry Tomatoes, used canned diced tomatoes. You can use less Chorizo sausages, but don’t skip this step! Fresh Oregano can be expensive if not in season, substitute 2 teaspoons of dry oregano in the meat mixture. But ideally, keep the recipe as is, your taste buds will thank you! This is a larger Lasagna recipe, using a deep 13″x9″ dish. If you are using a glass Pyrex style lasagna dish, I recommend reducing the amount of meat and ricotta, otherwise it will overflow. Plato said “knowledge is food for the soul”, but after eating this lasagna, I hope you’ll disagree with him. Plato’s never eaten my Meat Lasagna Recipe with Chorizo. Bon Appetit! Приятного аппетита! Delicious Meat Lasagna Recipe made better with Chorizo, creamy Ricotta, Cherry Tomatoes and fresh Oregano. It’s the perfect Italian comfort food! Carefully remove the cases around the chorizo. Dice the chorizo into small pieces. Cook the chorizo and lean ground beef into a large heavy bottomed saucepan over medium heat. Fry for 10 minutes until the beef is throughly cooked. Do not add oil into the saucepan, as the chorizo will release oil. Drain any excess oil. Add the garlic, chili peppers and fresh oregano leaves and cook for 2-3 minutes. Save some oregano to garnish lasagne before serving. To complete the meat sauce, add the canned Cherry Tomatoes, Passata, sugar, salt and pepper. Reduce heat, simmer for 10 minutes or until the liquids starts reducing. Preheat oven to 180°C (350°F). Mix the ricotta and the shaved Parmesan cheese in a bowl. Use a 13x9 inch baking dish to build your lasagna. Start with spreading 1 cup of your meat sauce across the base of the baking dish. Top with a layer of fresh lasagna sheets. Spoon half of the Ricotta mixture and spread evenly. Add another layer of lasagna sheets and spoon half of the meat mixture over the lasagna sheets. Repeat with another layer of Ricotta and then the meat. Sprinkle with grated mozzarella and bake in the oven for 25 minutes. Garnish with fresh oregano leaves. Allow lasagne to rest for 10 minutes before serving. * Passata is an uncooked tomato purée that’s been strained of seeds and skins. If your supermarket doesn’t carry Passata, it can be found in Italian delis. Any brand of Passata will do, but the Mutti brand is beautifully thick and rich. If unavailable, substitute with several cans of crushed tomatoes or tomato puree. Thanks Susan! My kids love this recipe, alway going for seconds! 🙂 Thanks for checking it out! Made this lasagna for a family get together and everyone really liked it. So glad I tried out the recipe, will definitely make it again. Thanks for sharing. Thanks Fran for the great feedback! I’m glad it worked and that your family enjoyed it! ??? ?